Have you ever noticed that human relationships have their ups and downs? Friendships are sometimes enjoyable and other times not enjoyable. Sometimes they're secure and other times, insecure. We've seen in previous lessons that the prophets of the Old Testament were emissaries of God's covenant with his people, and to understand this emissarial function, we have to understand that the prophets realized that the relationship between Israel and God had its ups and its downs. 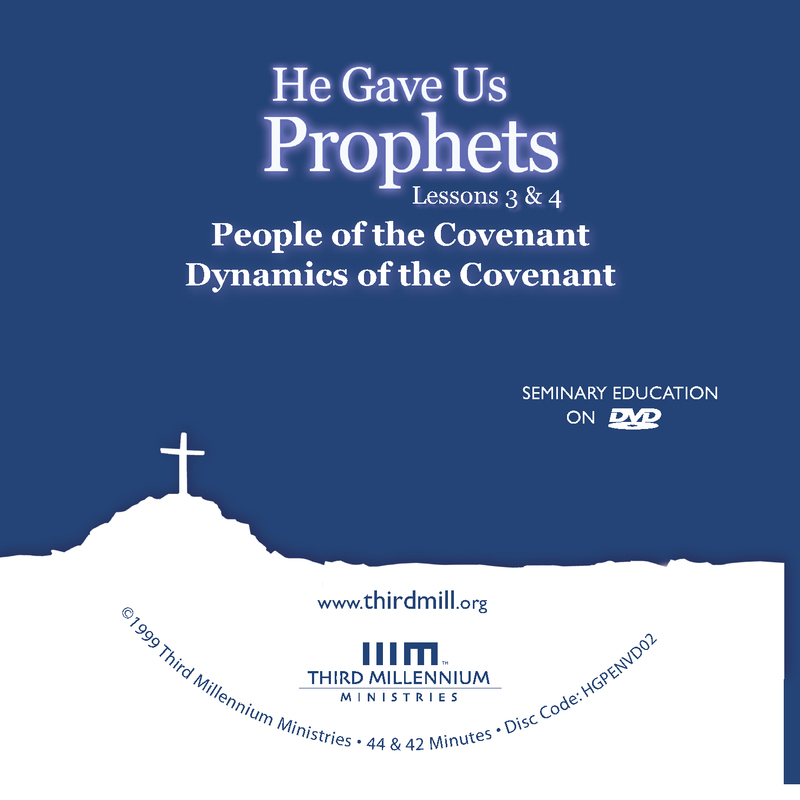 We've entitled this lesson, the "Dynamics of the Covenants." In this lesson, we are going to look at three different topics: first, we will explore the covenant ideals. Second, we'll examine covenant judgment — how did the prophets minister on God's behalf when the people fell under divine judgment? And then third, we're looking to covenant blessings — how did prophets speak of blessings that God offered to his people? Grasping these dynamics of covenant life will help us understand Old Testament prophecy and how it applies to the church and the world today. What were the basic ideals of covenant life with Yahweh? Now the earth was formless and empty, darkness was over the surface of the deep and the spirit of God was hovering over the waters (Genesis 1:2). "You are free to eat from any tree in the garden; but you must not eat from the tree of the knowledge of good and evil, for when you eat of it you will surely die" (Genesis 2:16-17). So the Lord said, "I will wipe out mankind, whom I have created, from the face of the earth." But Noah found favor in the eyes of the Lord (Genesis 6:7-8). "Be fruitful and increase in number; multiply on the earth and increase upon it" (Genesis 9:7). "I will make you into a great nation and I will bless you. I will make your name great and you will be a blessing. I will bless those who bless you, and whoever curses you I will curse; and all people on the earth will be blessed through you" (Genesis 12:2-3). "I am God Almighty; walk before me and be blameless. I will confirm my covenant between me and you and will greatly increase your numbers" (Genesis 17:1-2). "I am the Lord your God, who brought you out of the land of Egypt, out of the house of slavery" (Exodus 20:2). "Now if you obey me fully and keep my covenant, then out of all nations you will be my treasured possession" (Exodus 19:5). "I took you from the pasture and from following the flock to be ruler over my people Israel" (2 Samuel 7:8). "If [David's] sons forsake my law and do not follow my statutes, if they violate my decrees and fail to keep my commands, I will punish their sin with the rod, their iniquity with flogging" (Psalm 89:30-32). For it is by grace you have been saved, through faith — and this is not from yourselves, it is a gift of God — not of works, so that no one can boast (Ephesians 2:8-9). For we are God's workmanship, created in Christ Jesus to do good works, which God prepared in advance for us to do (Ephesians 2:10). "He who has an ear, let him hear what the Spirit says to the churches. To him who overcomes, I will give the right to eat from the tree of life, which is in the paradise of God" (Revelation 2:7). It's very important to realize that Old Testament prophets did not invent the types of judgments that they threatened. On the contrary, they looked to the Scriptures of the Old Testaments for lists or catalogs of the kinds of judgments that the people of God should expect. The vocabulary of the prophets reveals that they often depended on passages that come from the books of Moses. There are five main passages that guided the prophets as they listed off the kinds of judgments that would come against the people of God: Deuteronomy 4:25-28, Deuteronomy 28:15-68, chapter 29 of Deuteronomy, verses 16-29, and chapter 32 of Deuteronomy, verses 15-43, and finally Leviticus 26:14-39 provided information to the prophets as they sought to understand the types of judgments that God would bring against his people. There is so much material in these passages that it is difficult to summarize what they say. But it is safe to say that Moses wrote these passages to convey to the nation that there were two basic categories of covenant judgment. Now, what kinds of natural judgments would come against the visible covenant community? Deuteronomy 4, 28, 29, and 32 as well as Leviticus 26 list at least six major types of natural judgments against the people of God. First, these chapters in the books of Moses tell us that God will sometimes send drought to the land of Israel. This drought would dry up the land so that the people will suffer tremendously, and there will be a pestilence. Famine will also come so that the people will have no food when they rebel flagrantly against the Lord. And disease will come upon them — they will receive fevers and boils and tumors and plagues. Wild animals will threaten human life and there will be a loss of population. Infertility and untimely death will decimate the animal and human population in the Land of Promise. "My house…remains a ruin, while each of you is busy with his own house. Therefore, because of you the heavens have withheld their dew and the earth its crops. I called for a drought on the fields and the mountains, on the grain, the new wine, the oil and whatever the ground produces, on men and cattle, and on the labor of your hands" (Haggai 1:9-11). Shave your heads in mourning for your children in whom you delight; make yourselves as bald as the vulture, for they will go from you in exile (Micah 1:16). What processes of judgment did the prophets expect to take place? The prophets learned the process of judgment primarily from Leviticus 26:14-39. In this passage, Moses describes judgment as something that takes place over a long period of time and follows a particular pattern. As we examine this passage, we'll find at least three principles that govern the manner in which these judgments will come: God will show patience, but the judgments would increase in severity, and there will be a particular climax to these judgments. Let's think first about divine patience. Return to the Lord your God, for he is gracious and compassionate, slow to anger and abounding in love, and he relents from sending calamity (Joel 2:13). Now, the first principle of covenant judgment in Leviticus 26 is that God will be patient, but there is a second principle as well — God's covenant judgments will come with increasing severity. "Put your house in order, because you are going to die; and you will not recover" (Isaiah 38:1). "The time will surely come when everything in your palace … will be carried off to Babylon. Nothing will be left" (Isaiah 39:6). "I will scatter you among the nations and will draw out my sword and pursue you. Your land will be laid waste, and your cities will lie in ruins" (Leviticus 26:33). "You have lifted up the shrine of your king, the pedestal of your idols, the star of your god which you have made for yourselves. Therefore, I will send you into exile" (Amos 5:26-27). "While you were doing all these things, declares the Lord, I spoke to you again and again, but you did not listen; I called you, but you did not answer. Therefore, what I did to Shiloh I will now do to the house that bears my Name, the temple you trust in, the place I gave to you and your fathers. I will thrust you from my presence, just as I did all your brothers, the people of Ephraim" (Jeremiah 7:13-15). "Do not be afraid, O wild animals, for the open pastures are becoming green. The trees are bearing their fruit; the fig tree and the vine yield their riches. Be glad, O people of Zion, rejoice in the Lord your God, for he has given you the autumn rains in righteousness" (Joel 2:22-23). "The seed will grow well, the vine will yield its fruit; the ground will produce its crops, and the heavens will drop their dew" (Zechariah 8:12). "In that day I will restore David's fallen tent. I will repair its broken places… and build it as it used to be so that they may possess the remnant of Edom and all the nations that bear my name" (Amos 9:11-12). "They will beat their swords into plowshares and their spears into pruning hooks. Nation will not take up sword against nation, nor will they train for war anymore" (Micah 4:3). Return, O Israel, to the Lord your God. Your sins have been your downfall! Say to him, "Forgive all our sins and receive us graciously, that we may offer the fruit of our lips" (Hosea 14:1-2). Notice that Hosea did not say that his readers should work hard and earn the blessings of God. On the contrary, the faithful in Israel knew that only mercy from God would bring about blessings. They sought forgiveness as a basis for covenant blessing — not human merit. "Go tell Hezekiah, 'This is what the Lord, the God of your father David, says: I have heard your prayers and seen your tears; I will add fifteen years to your life'" (Isaiah 38:5). "By the way that he came he will return; he will not enter this city," declares the Lord. "And I will defend this city and save it for my sake and for the sake of David my servant!" (Isaiah 37:34-35). "Even in those days," declares the Lord, "I will not destroy you completely" (Jeremiah 5:18). Even if you have been banished to the most distant land under the heavens, from there the Lord your God will gather you and bring you back. He will bring you to the land that belonged to your fathers, and you will take possession of it. He will make you more prosperous and numerous than your fathers (Deuteronomy 30:4-5). "I myself will gather the remnant of my flock out of all the countries where I have driven them and I will bring them to their pastures where they will be fruitful and increase in number" (Jeremiah 23:3). Proclaim this song among the nations: Prepare for war! Rouse the warriors! Let all the fighting men draw near and attack (Joel 3:9). "Then you will know that I, the Lord your God, dwell in Zion, my holy hill. Jerusalem will be holy; never again will foreigners invade her" (Joel 3:17).